Wes Bergevin originally followed in his father’s footsteps. He started out as a hockey player. He even had the opportunity to eat ice cream out of the Stanley Cup. But the Hinsdale Central senior is all about soccer these days. Wes was one of only 10 juniors and five goalies to earn all-state honors last season while netting 12 shutouts to help Hinsdale Central win the West Suburban Silver title and finish 20-1-2. This season, the Red Devils got off to an 11-3-4 start, with the 6-foot-3 Wes netting his 11th shutout in a 2-0 homecoming win over Fenton on October 11. Trying to stop opponents from scoring is in Wes’s blood. His father, Marc, was a defenseman in the National Hockey League for 20 years on eight teams before retiring in 2004. Drafted by the Chicago Blackhawks in 1983, Marc played for the parent club from 1984-89 and was the Director of Pro Scouting when the Blackhawks won the Stanley Cup in 2010. He now serves as general manager of the Montreal Canadians. Having a father as a professional athlete seemed fairly normal for Wes, except for a few moves to new cities. “For me, it was no different than having a father who was a very busy lawyer or business executive,” Wes says. One of the moves that the Bergevins made when Wes was eight led him to soccer pitches. “I was playing hockey because I was in Pittsburgh. Then we moved to (San Diego) California, and there were really no rinks around. So, I picked up soccer,” Wes recalls. “I figured out it was something I really liked.” Then, when he was in the sixth grade, his family moved to Hinsdale. 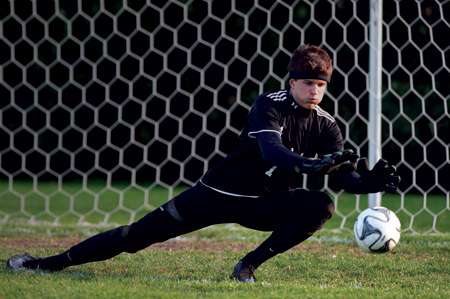 During a summer camp, it was Hinsdale Central soccer coach Mike Wiggins who suggested that he play goalie. Wes, who allowed only eight goals last season, is quick to credit his defense, including seniors Evan Floersch and Will McGowan and junior Nick Silva. But Wes got the job done himself with two big saves during penalty kicks to clinch a 3-2 win over Oak Park-River Forest on October. 7. Wes—who is receiving growing Division I college interest from such programs as Northern Illinois, Bradley and High Point N.C.—tries to make as big of an impact off the field as he does on it. He hopes to spend a week this summer helping to build a home in West Virginia with Habitat for Humanity. He did it two summers ago, and he’d like to do it again. Wes also passes out food to the homeless in Chicago twice a year with a school club.